Who was Television’s First Star? Felix rose to TV stardom in the late 1920s, when the American communications giant, RCA, chose him as a test subject for its television research. The lighting required to reflect images into the primitive television camera of the day proved far too hot for humans to stand, so using an inanimate object was the only option. The engineers purchased this papier maché figurine of FELIX from the famed toy store, F.A.O. Shwartz in New York City, just up 5th Avenue at 57th Street from their own offices at Rockefeller Centre. Felix fell off his turntable often, which explains his “imperfect” condition. First his tail fell off, then his head, which was reattached with a drumstick. It was in 1928 that RCA first broadcast Felix from the Empire State Building. 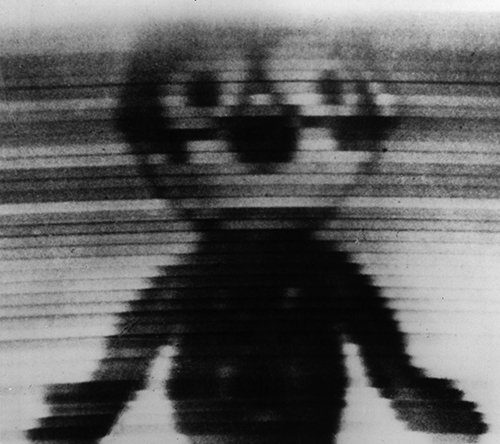 Later, Felix was honoured when RCA transmitted his image on the first commercial television broadcast in 1939, as a lead up to the formal unveiling of television at the New York World’s Fair. 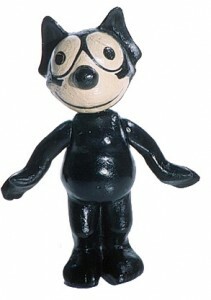 Thus, Felix the Cat became Television’s First Star! Before his television debut, this cat enjoyed many lives in animated film. Created by Otto Messmer, the initial series played from 1920 to 1928. The fun-loving cat made a comeback in 1936, starring in three short films. Then, in 1960, a new series was produced for television that featured the debut of Felix’s magic bag of tricks. Felix’s most recent performance occurred in 1991, at the Ed Sullivan Theatre in New York City, as part of the first demonstration of High Definition Television in the USA.